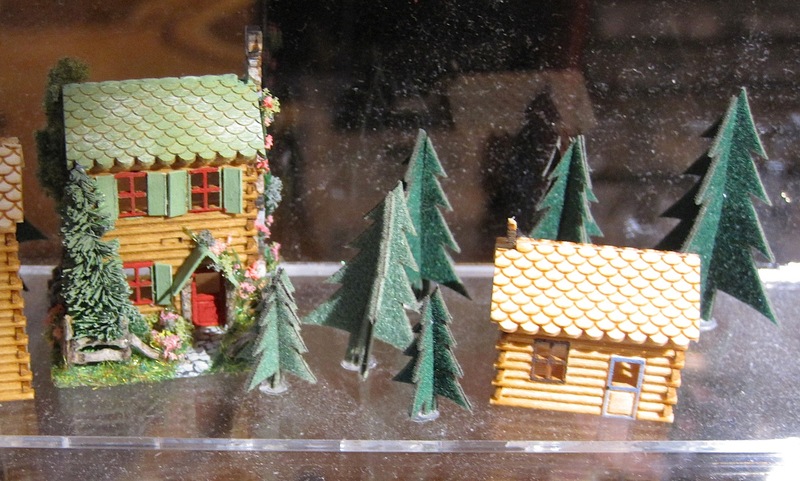 Many factors contribute to the success, or heaven forbid, failure, of a miniatures show, but the list of dealers must be considered the backbone of a great show. Getting a great dealer list together, though, is a bit of that old conundrum, which came first, the chicken or the egg? Can you get a great list of dealers to commit to your show if you don’t have a steady and healthy group of shoppers that attend regularly—and can you get a steady group of shoppers to come spend money regularly if you don’t have a great dealer list? General member and dealer Ruth Stewart of Stewart Dollhouse Creations specializes in kits to make many wonderful dollhouse miniatures including these tiny log cabin kits. The Guild’s Artisan and Fellow program encourages excellence within the organization and those Artisan and Fellow members that choose to participate in the annual show give the Guild Show dealer line-up a solid baseline of superb craftsmanship. Many general members also participate in the show. Some, like Arlene Finkelstein of Artistic Florals, specialize in a specific category while others, like Darren Scala and Karon Cunningham are general dealers-their speciality being the taste with which they acquire and resell miniatures in a wide range of prices. 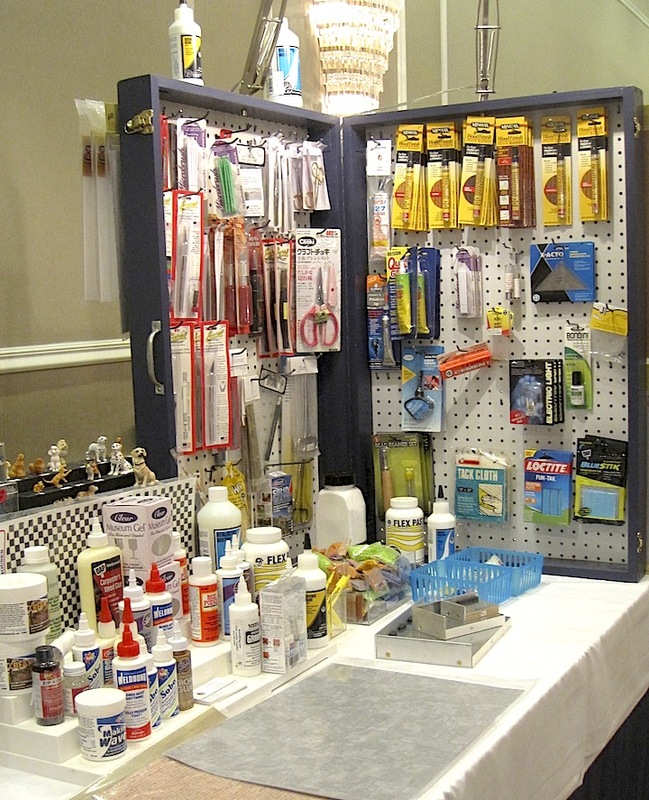 A third, very important group of dealers are those that bring to the show the many and varied tools, materials and widgets that enable all of us to begin and finish our miniature projects, be they a house, a room box or a piece of furniture. General member and dealer Ann Pennypacker of Aminithing specializes in tools and materials for those who prefer to do-it-themselves. All of these groups of dealers are essential to a well-rounded and well-attended show with something for every pocket book and every shopping list. 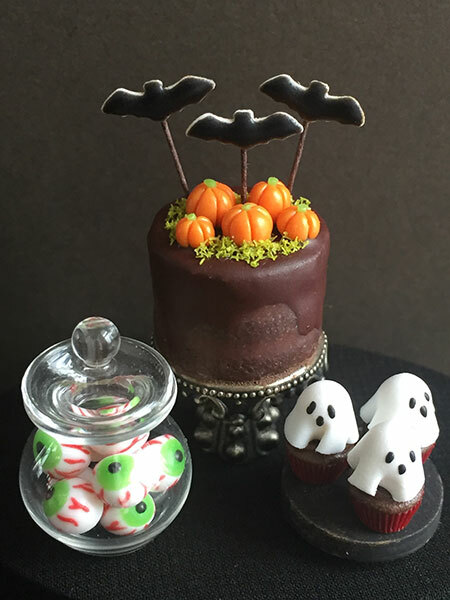 And with many other attractions on the show schedule, the miniature magic will be twinkling around the Hartford/Windsor Marriott come the third week of September! Visit www.igma.org to view the entire dealer list, roster of classes and the schedule of events for show week. A Brand New Schedule of Classes! One thing that the Guild is well known for is excellent educational opportunities. The Guild School is known and respected world-wide, Guild Study Programs have a steady following of devoted attendees, and classes, in a variety of lengths and media, abound at every Guild Show. This year’s show is no exception with 22 classes offered in a variety of lengths from a couple of hours or up to 3 days, in media ranging from doll sculpting, to furniture making, to painting…including two classes in 1/144 scale! 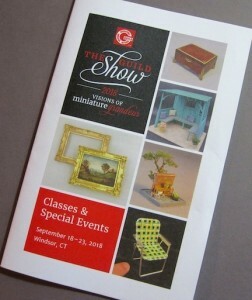 Guild Show class brochure, illustrating each class and show offering at the 2018 Guild Show in Hartford, CT, this September. The Guild Show is being held September 19-21, 2018, at the Hartford/Windsor Marriott Hotel again this year. The hotel is conveniently located near major highways for those who will be driving, a short and free shuttle ride from the airport, and reasonably close to train and bus transportation as well. The show rate also includes free breakfast for two! 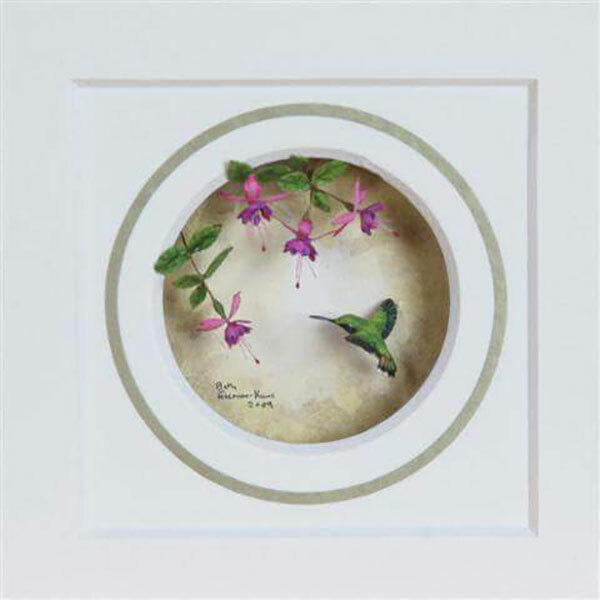 Beth Freeman-Kane, such an artist in depicting nature in miniature, will help you to create this colorful vignette of a hummingbird amongst the flowers. Fully illustrated brochures describing all class and tour offerings made their debut at the Chicago International Show last week. If you’re not on the IGMA or show mailing list, you can request one from the show director or check out the Show pages on the Guild’s website. This will be Jeannie Anderson’s (Maya Miniatures) first time at the Guild Show and she’ll be teaching her students how to create these super cute Halloween treats! Evidently the ancient Babylonians were the first people to make New Year’s resolutions but experts believe those resolutions were probably more along the line of pledges made to the gods in hopes for good luck in the coming year, and may have involved returning borrowed equipment and paying off debts. Back then, the New Year began in March with the start of the new agricultural cycle. By that calendar, I’m still a little ahead of the game wishing everyone a happy New Year in February. Whether you are hoping for good luck from the gods, or looking for help closer to home, making New Year’s resolutions have long been the human attempt to retool some facet of their lives that they are unhappy with. Many resolutions fall by the wayside just a few weeks, or even days into the new year. I often resolve to try and get more organized in order to get more done. Its not a ridiculously unreachable goal-and it sounds good–every year! I have made strides in the reorganizing direction, and I will continue to do so, but have I gotten any more done this year? Nope, in fact I’d venture a guess that I’ve gotten even less done this year than I have in past years. Some of it can be laid directly at the door of procrastination, but also equally guilty are other commitments in my life. As one gets older, and looks happily towards retirement and the thought that then we’ll be able to get things done-well, its nice to have dreams! I tend to enjoy reading self-help books and articles. I found an interesting one recently that suggested self-compassion was a healthier attitude to have than self-confidence. Having read so often that with a touch of self-confidence one can sail into, and succeed in, challenging situations it was eye-opening to read that these experts feel that self-confidence tends to make us over estimate our skills and consequently not know when we are in over our heads-and unlikely to admit it should we be that prescient. With self-compassion we acknowledge that we are not perfect, but are trying to do the best we can in a world that is also imperfect. With self-compassion we cut ourselves some slack, rather than beat ourselves up, when we fail, and its far healthier that way. Its not making excuses, its more living with reality; its allowing yourself to learn from failure rather than running away from it. So, Happy New Year! Did you make any resolutions? If you’re interested in reading the article I reference above, it can be found here. Site Map | Website: Roxby Design | © Copyright 2008-2019 International Guild of Miniature Artisans, Ltd. All rights reserved.